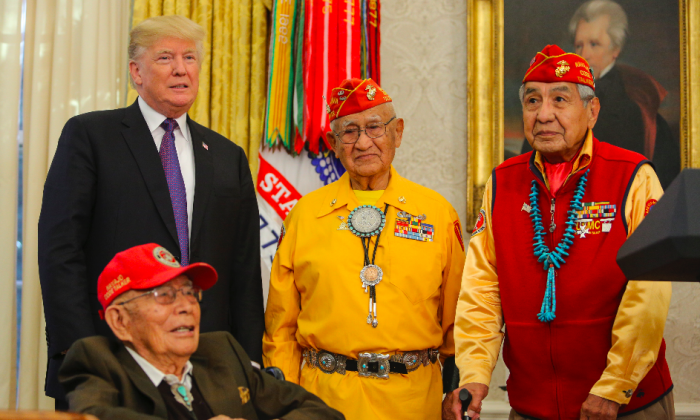 WASHINGTON—Three of the 13 surviving Navajo Code Talkers of World War II met with President Donald Trump at the White House on Nov. 27. Speaking at the event, Peter MacDonald, 90, president of the surviving code talkers, said he enlisted in the Marine Corps to become a code talker in 1944, when he was 15. In early 1942, the suggestion was made to use the Navajo language as a code. MacDonald said the Marine Corps recruited 29 young Navajos. After basic training, they were taken to Camp Elliott near San Diego. The Navajo Marines created 260 code words, committed to memory only. MacDonald said that three weeks after the landing, Gen. Alexander Vandegrift, commander of the 1st Marine Division, sent word back to the United States saying the code was working and to please send more Navajos. “Eventually, by the time the war ended, 1945, there were 400 of us that went to war,” MacDonald said. He said the code grew to 600 words by the end of the war, still by memory only, and Navajo was used for all top-secret messages in battle. English was used for all other communications. “In every battle—from the frontline, beach command post, command ship, all other ships—code talkers were used,” MacDonald said. The successful taking of Iwo Jima was attributed to the Navajo Code Talkers. Accompanying MacDonald at the White House were Navajos Fleming Begaye and Thomas Begay. Begay was a code talker on Iwo Jima with the 5th Marine Division, said MacDonald. “Also, as if Marine Corps was not enough, he enlisted to be United States Army and served in the Korean War. Survived that awful battle at Chosin,” he said. MacDonald said the 13 remaining Navajo Code Talkers still have one mission left: to help build a national Navajo Code Talker museum. “What we did truly represents who we are as Americans,” MacDonald said. “America, we know, is composed of diverse community. We have different languages, different skills, different talents, and different religion. “But when our way of life is threatened, like the freedom and liberty that we all cherish, we come together as one. And when we come together as one, we are invincible. We cannot be defeated. Trump said he invited the code talkers to the White House to honor their contribution and promised to help bring the museum to fruition. Trump asked his chief of staff, retired Gen. John Kelly, to say a few words. “What these men did, the advantage they gave our Marines when they invaded Iwo Jima was really—and I think it was pointed out—was one of the very few factors that allowed us to be successful on that island,” Kelly said.